Brown pelican public domain National Park Service photo by Rodney Cammauf: Everglades Wildlife Images. Louisiana's official nickname is "The Pelican State" and the brown pelican appears on Louisiana's state flag, state seal, the state painting (along with many other symbols and icons of Louisiana), and is one of three Louisiana symbols displayed on the U.S. mint's bicentennial quarter. 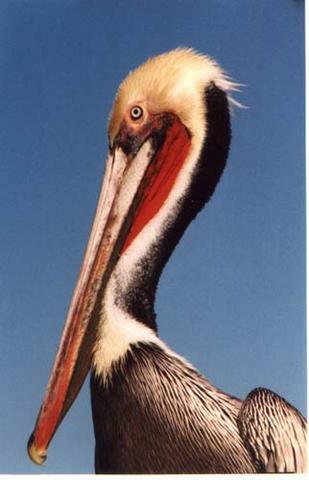 The state bird of Louisiana is unique among the world's seven species of pelicans. 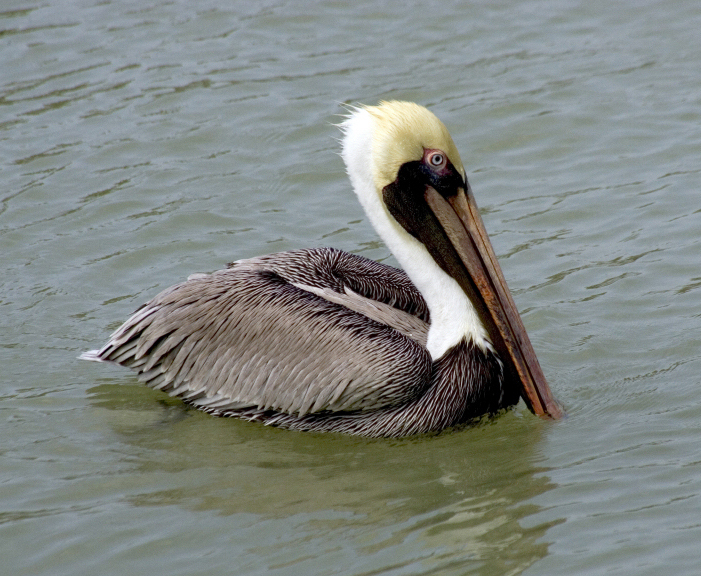 The brown pelican is found along the ocean shores and not on inland lakes. It is the only dark pelican, and also the only one that plunges from the air into the water to catch its food. Pesticide use caused pelicans to stop nesting along the Louisiana coast in 1961, and they completely disappeared by 1966. Louisiana began attempting to re-populate its coastline by transporting Florida fledglings into the state. The US Fish and Wildlife Service listed the brown pelican as an endangered species in 1970, but the Federal Government declared the brown pelican "recovered" in Louisiana in 1995 . About 40,000 brown pelicans call "The Pelican State" their home today. Brown pelican; photo © Gae Berry / Animal Diversity Web / U of Mcihigan (all rights reserved; used by permission). 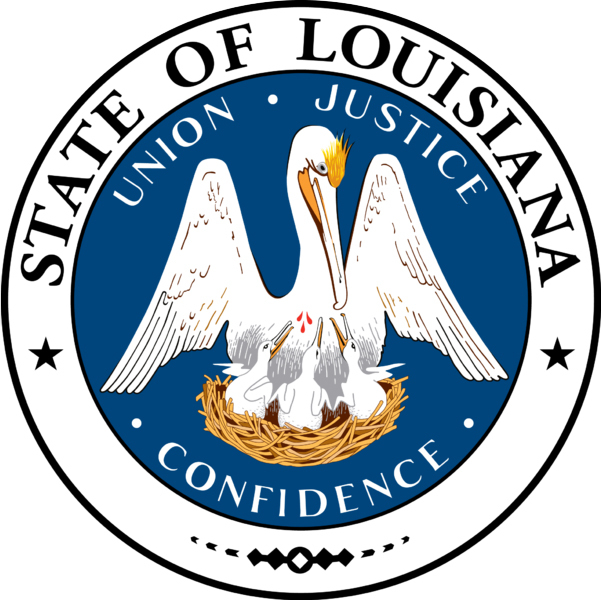 Seal of Louisiana (public domain image on Wikipedia). Louisiana became the 18th state in 1812. 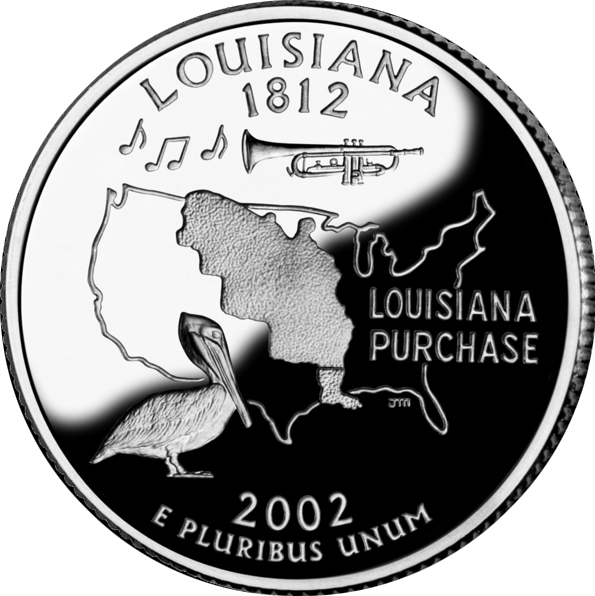 The Louisiana quarter features the state bird (brown pelican), a musical symbol for New Orleans Jazz, and an outline of the original Louisiana purchase (public domain image on Wikipedia).